Front image from the Touhou Bougetsushou webpage. 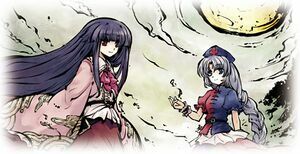 Touhou Bougetsushou (東方儚月抄) is a loosely interconnected storyline about the Lunarians that includes Silent Sinner in Blue, Cage in Lunatic Runagate, and Inaba of the Moon and Inaba of the Earth. Bougetsushou (儚月抄) can be translated as "Ephemeral Moon Vignette"; compare with the main title of its predecessor 東方永夜抄　～ Imperishable Night (Touhou Eiyashou), where "永夜抄" translates to "Eternal Night Vignette". 東方儚月抄　～ Silent Sinner in Blue, a manga drawn by Aki★Eda and written by ZUN, serialised in Comic Rex. 東方儚月抄　～ Cage in Lunatic Runagate, a novel written by ZUN and illustrated by TOKIAME, serialised in Chara☆Mel. Silent Sinner in Blue (CD), a music CD included with the first volume of the Silent Sinner in Blue tankoubon. Due to being split across multiple titles which ran at the same time, piecing together the full story of Touhou Bougetsushou can be difficult. For convenience, all material connected to the storyline is listed below in order of release. This page was last edited on 29 October 2016, at 13:56.